This 1st-level adventure set in the city of Lankhmar is intended as a 'meet' adventure at the beginning of the campaign, an opportunity for the party to form up and forge some common bonds as well as to complete the adventure. It's designed for a small group but will require both a wizard and a thief. There's a succinct background for the GM, and then an explanation of how the adventure begins - it's suggested that it begins in media res, and runs fast and fun to at least one of three possible climaxes, depending on what the characters get up to as the adventure progresses. Put succinctly, what will become the party encounter one another as each character independently decides that it would be a good idea to burgle the home of a renowned collector of valuable items and caravan master on the night he's throwing a big party to celebrate the acquisition of his latest piece. At this masked ball, all the player-characters find themselves in the cellar antichamber to the collector's treasure vault... but before they can puzzle out why anyone else is there when they snuck in alone, some security guards arrive and a fight breaks out. The fight isn't designed to be too challenging, so once the guards are defeated, the player-characters can make introductions as they catch their breath and decide what to do next. Hopefully they'll realise that they might do better co-operating than working on their own. The challenge of actually getting into the vault ought to do the trick... but that is only still the beginning of the adventure. What they find will lead them on to further discoveries and riches - but they still need to exfiltrate and, well, shall we say that they may not be the only people who thought it was a good night for a heist. Once they are outside with their loot, a spot of research will be necessary, as what they discover points to a greater treasure, a set of magical gold masks. Hopefully this research will again be collaborative, further cementing the group together. There's an optional encounter with a potential patron, and then it's time to mount a further raid on a former temple in town to get the goodies. With atmospheric descriptions and many encounters, there is ample opportunity for plenty of high jinks before the objective is attained - an inkling of this is revealed by some detailed rules for running foot-chases across the rooftops. The final section covers ending the adventure. Given the clear and present danger the masks pose to the entire city, some or all of them might have been damaged by now, lowering their value... that is, if they didn't get loose to cause problems all over town. Oh, and the Thieves' Guild probably want a word. Winding up the adventure is no easy matter, there are lots of loose ends to sort out and most of them have the potential to lead to further adventures. 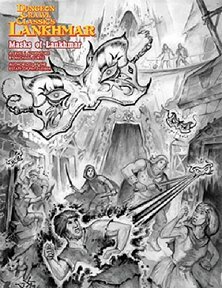 This adventure presents the fast, violent fun that ought to fill the pages of any adventure in Lankhmar, and should set up the new-fledged party as a force to be reckoned with as the campaign proceeds. Return to Masks of Lankhmar page.